Last month I touched base on analogous colors . Today I'm looking at complementary colors. This isn't a technical color post but rather my observation of complementary colors in my world. Complementary colors are any two colors that fall directly opposite of each other on the color wheel. The most basic complementary color pairs are red and green, orange and blue, and yellow and purple. Shift a step on the wheel and you get combinations like lime green and red-violet, aqua and red-orange, yellow-orange and indigo. 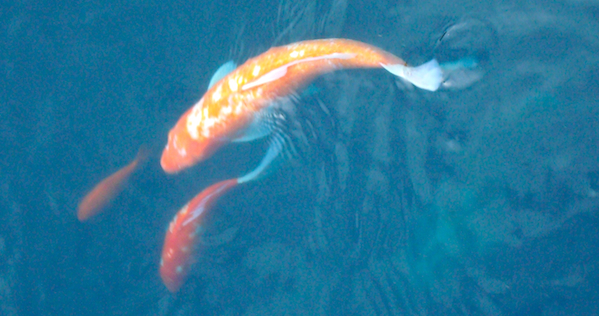 Complementary colors naturally create contrast because they oppose each other on the color wheel. 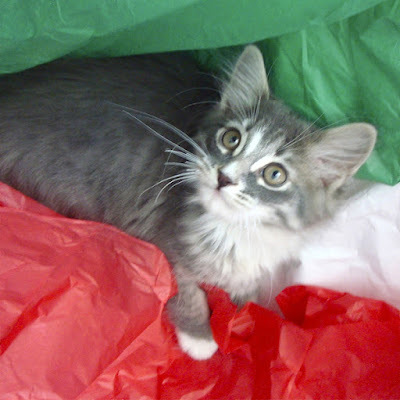 This can be used quite effectively to create very dynamic color compositions in graphics and quilts. Tis the perfect season for spotting complementary colors since red and green play such a dominant role in Christmas decor. I love decorating with red and green for Christmas. Of course red and green aren't just seen during the holidays. This dynamic combination occurs year round if you look for it. All types of reds. All types of greens. Here's a little red and green from my stash . . . The complementary colors of blue and orange are abundant here in Colorado since they happen to be the Denver Bronco colors (our NFL football team for those of you outside the USA). It's actually a bit overwhelming to walk into a store and be confronted with this much bright, bright orange. 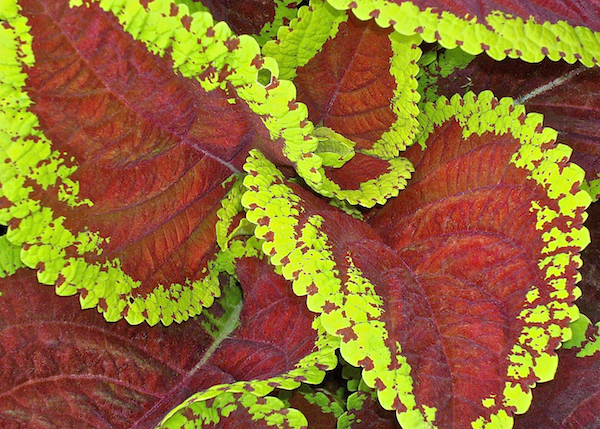 Nature always comes through with beautiful color combinations . . . I also found a fair share of blue and orange combinations in my stash . 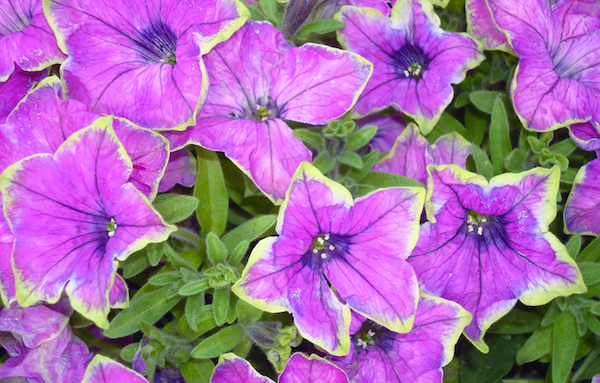 . .
Purple and yellow seemed to be the hardest to find examples of. 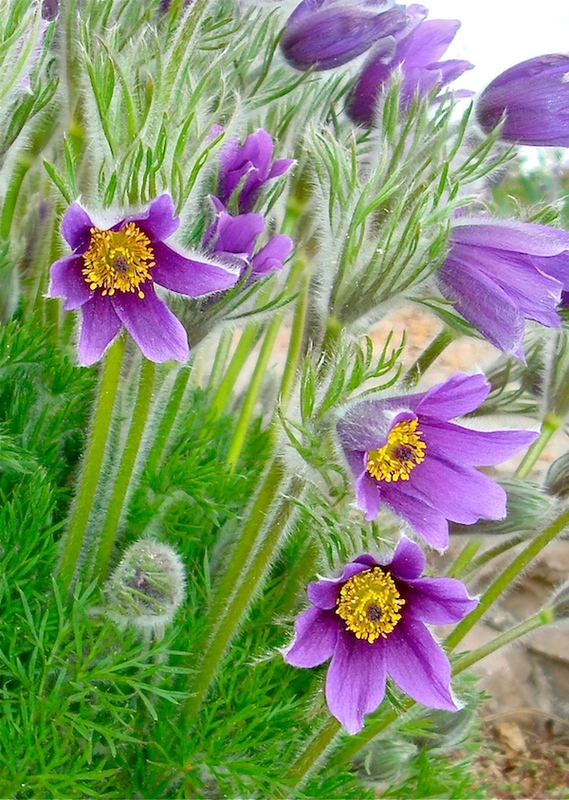 This combination occurs in nature but it's winter here so the flowers are sleeping. 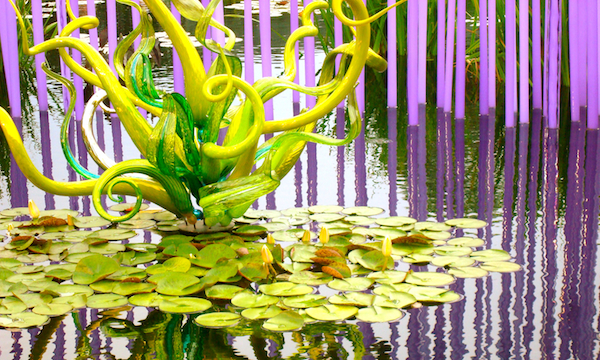 I did have these photos from the Botanical Gardens. And I found these graphic purple and yellow mugs in Anthropologie . . . I've always wanted to make a quilt with this fabric group . . .
Or how about this nice complementary purple and yellow bee block I made for Cindy . . . Using equal amounts of complementary colors can be overwhelming. When both colors occur in the same amounts they compete with one another. One great way to use complementary colors is to vary the amounts. Use one color as the dominant hue and add just a pop of the opposite color. This technique is often used in interior design by using an accent color to punch up the space. I like this use of complimentary colors because it really calls attention to the smallest detail and can be very dynamic. 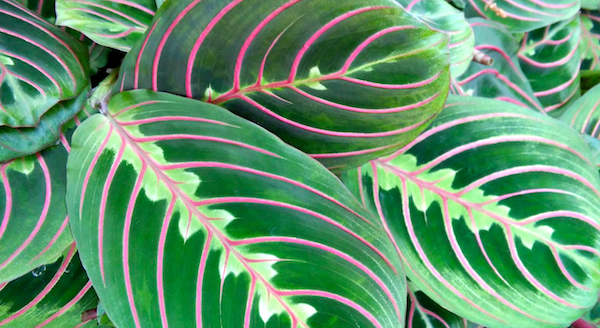 These leaves are a perfect example . 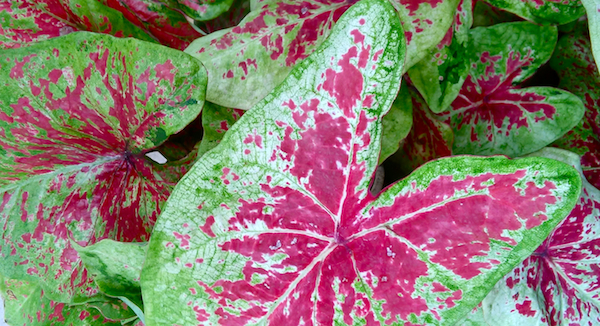 . . rather than noticing the green leaves, you really see the red veins. You can also vary the level of contrast between complementary colors by playing with value. For example, pairing a strong pure hue with a lighter value of it's complement can soften the contrast. The soft pink flowers bring the level of contrast down a notch in this image. What I learned while looking for complimentary colors is that I don't use them very often. I usually lean toward analogous color schemes. 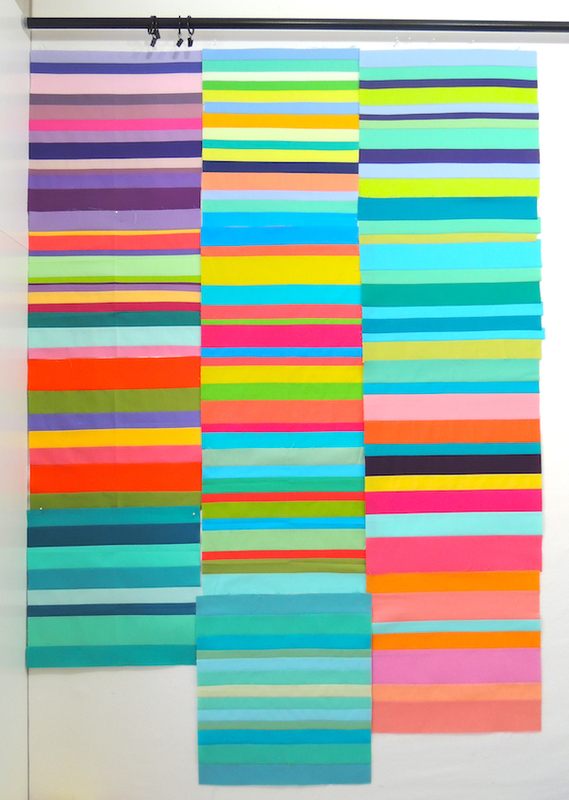 But complementary colors make dynamic quilts so you can bet I'll be exploring this combination more in 2016. 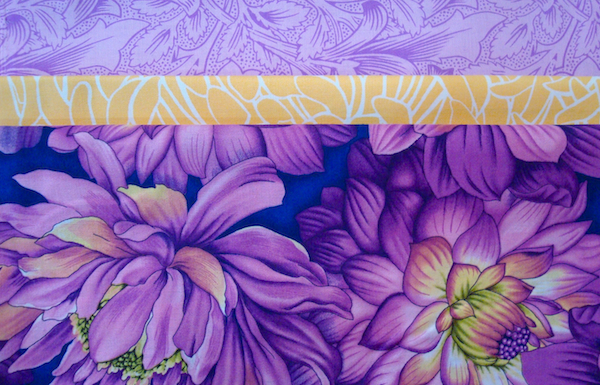 I already have one in mind with some great Amy Butler fabrics I've been collecting. Here are two quilts I made using complementary combinations. 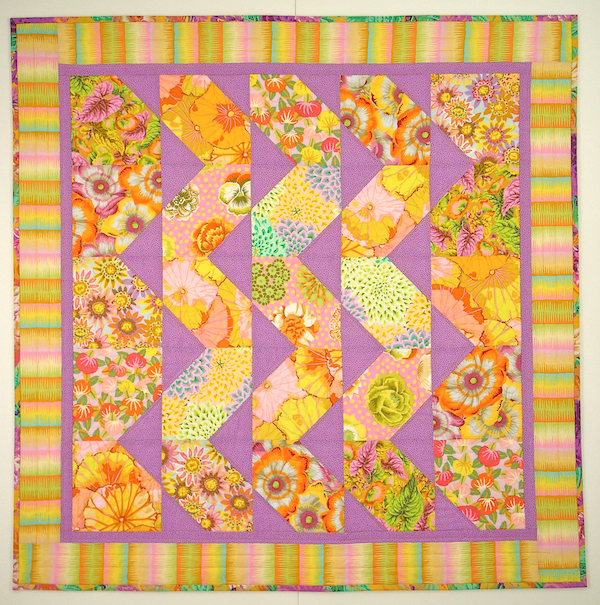 This yellow Kaffe quilt with purple accents made from my Cascade pattern . . .
And of course the best example so far would be my latest finish. The Drunkard's Path QAL Christmas quilt . 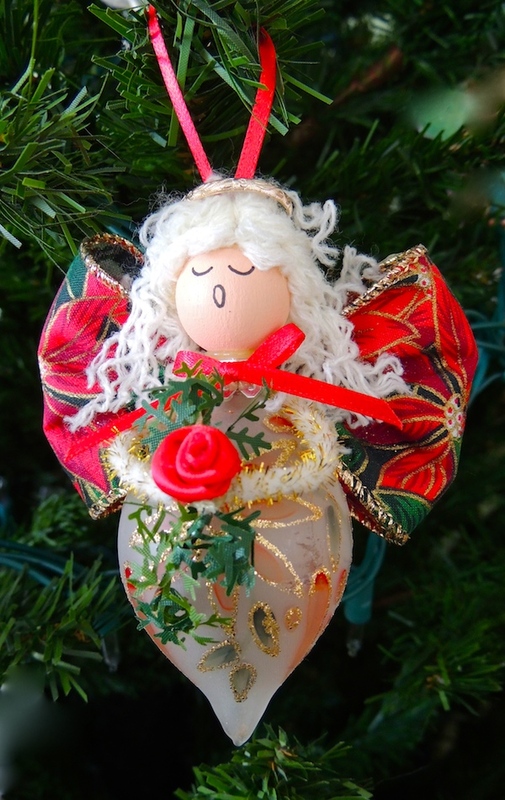 . . love this one and am so happy to have it hanging on the wall for the holidays. 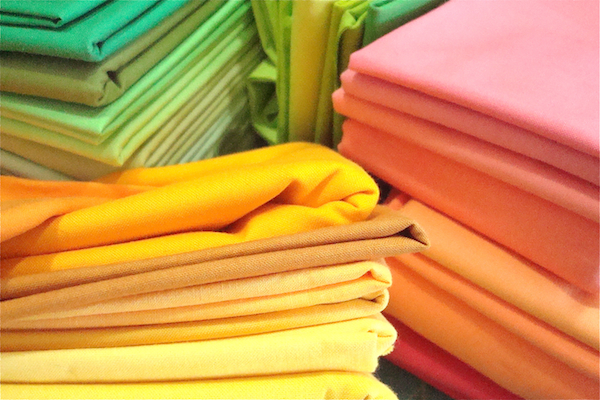 Can you find complimentary colors in your home or your wardrobe? 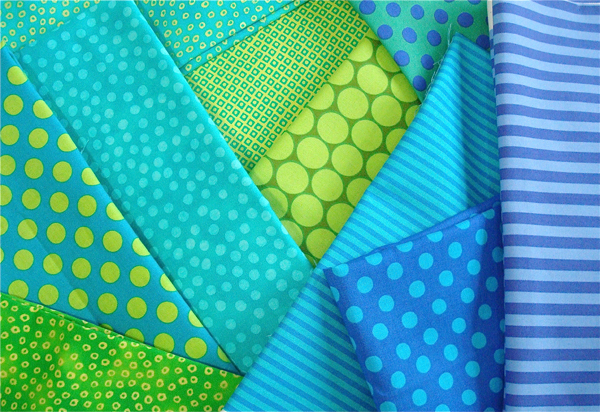 Do you use complimentary colors in your quilts? 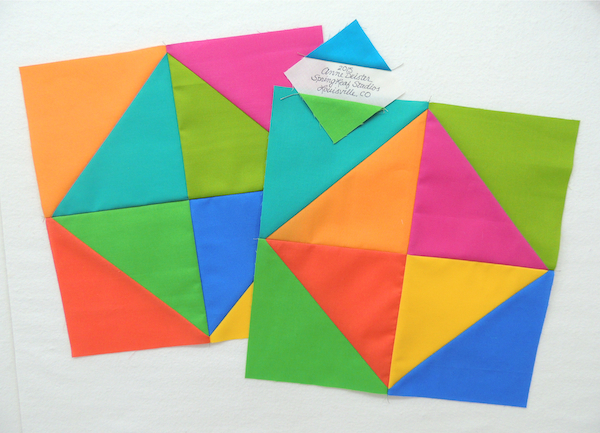 Why not make a quilt with complementary colors in 2016? I'll leave you with Opal seen here modeling some complementary colors when we first got her three years ago this month . . .
As with my single color stories, my intention here is to look for these color combinations in my own personal world. To see the colors around me in my house, my environment and my experiences. For that reason I've chosen to use my own photos rather than rely on the abundance of beautiful photos and color schemes available through sites like Pinterest and Design Seeds. 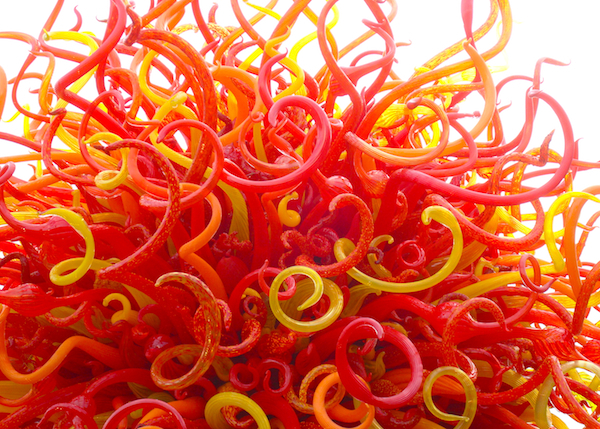 These sites are wonderful places for inspiration on color but I want my series to be personal . . . representative of the color I see around me. You can see all my other color stories under the Color Inspiration tab at the top of my blog. If you'd like to see additional beautiful color images, you can follow my Pinterest color boards here. I've also added a board on complementary colors here. Do check it out. There are some fabulous photos. I'd like to give you all a heads up about a new blog series starting in January. 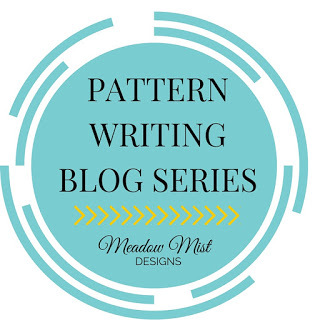 It's called the Pattern Writing Blog Series written and hosted by Cheryl Brickey of Meadow Mist Designs. Along the way she is having several pattern designers join her for a round table discussion about their own pattern writing process. Designers include Amy of 13 Spools, Christa of Christa Quilts, Lorna of Sew Fresh Quilts, Soma of Whims and Fancies, Yvonne of Quilting Jetgirl and myself. I'm thrilled to be participating and certainly look forward to learning new things from Cheryl and all the other designers.. If you've ever thought of writing your own patterns, or are just curious about what goes into the process, then join Cheryl and learn how it's done. Follow her at Meadow Mist Designs and myself here at Springleaf Studios. Just click the Bloglovin link below or one of the other choices along my sidebar. December . . . the final month in my Drunkard's Path QAL, and I'm thrilled to say I'm starting the month with a finish. WaHoo!!! You can find all the previous QAL posts here. November was the month of machine quilting and I will admit it wasn't easy. 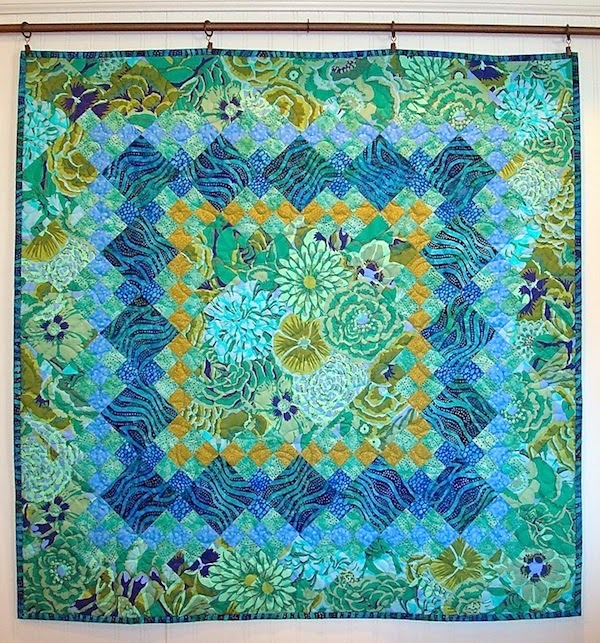 Free motion quilting is not something I particularly enjoy but the QAL provided me with the motivation needed to have a finish. That's a big one for me since I'm better known for multiple starts and fewer finishes. You can read my quilting post here where I look at possible quilting motifs to use and my process of exploring ideas. 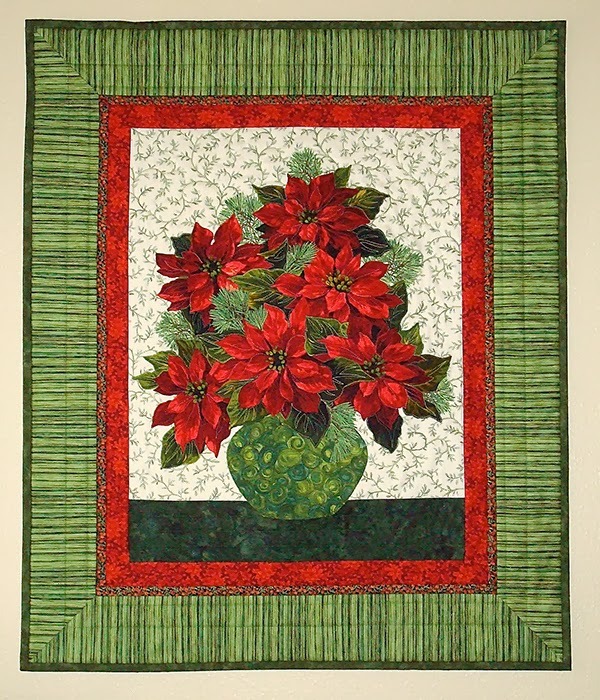 I ended up going with a poinsettia looking leaf design throughout including the borders. You can see a bit of it here. I was worried that the change in thread color would look bad on the back but it's not that noticeable when you see the back as a whole. With the quilting complete, all that remained was the binding. I find binding a relatively easy process. Especially after struggling with the quilting. Most often I don't decide on my binding fabric until the quilt is complete and then I audition various fabrics. 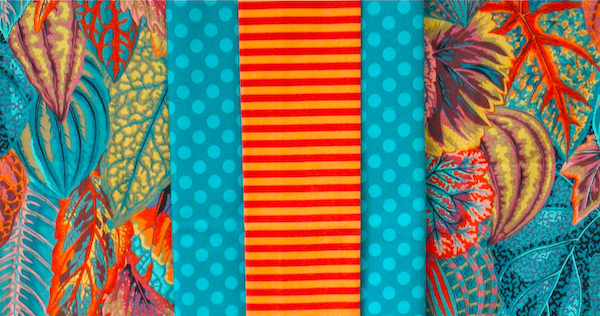 I especially love to use stripes for my binding and usually keep quite a few stripes on hand for that purpose. For this quilt I pretty much assumed it would be a red binding. I pulled out both red and green stripes to try and instantly knew the green was better. 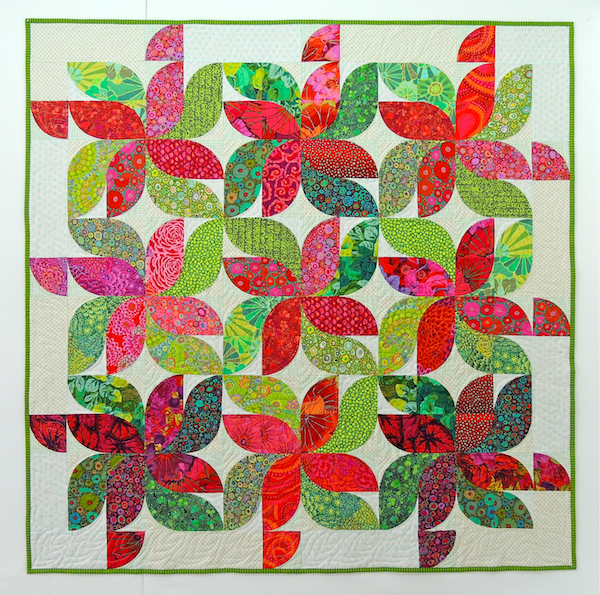 Either would look wonderful but the green really allowed the red fabrics within the quilt to shine. 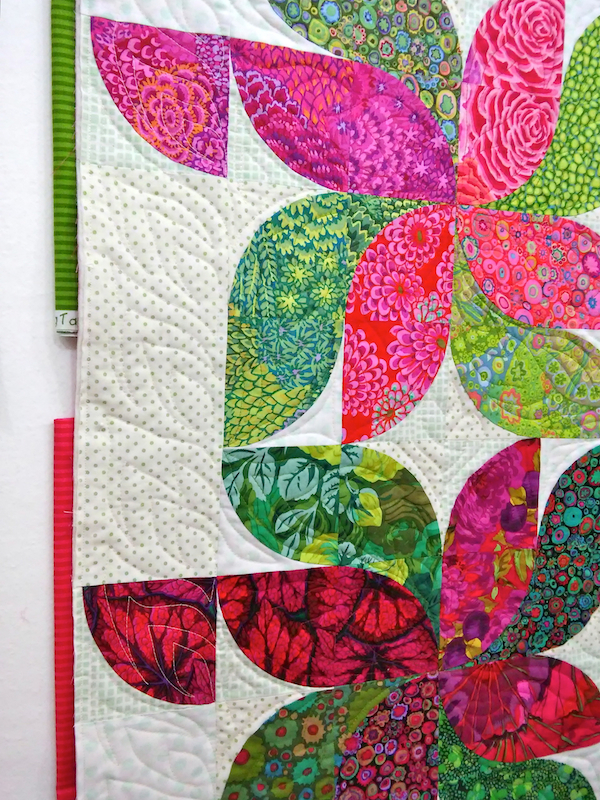 When I put the following image up on Instagram, Linda of @FlourishingPalms made the suggestion to use both colors in a flanged binding and recommended this great tutorial by Karen of @RedBirdQuiltCo. Social media can lead to learning so many great new things. I loved the look of Karen's flange binding and, after reading through the directions, felt sure this would be my choice. The best of both colors. Just a hint of red. Then I pulled a red solid and tried it. It looks really nice but once again I found the red shouted it's presence. 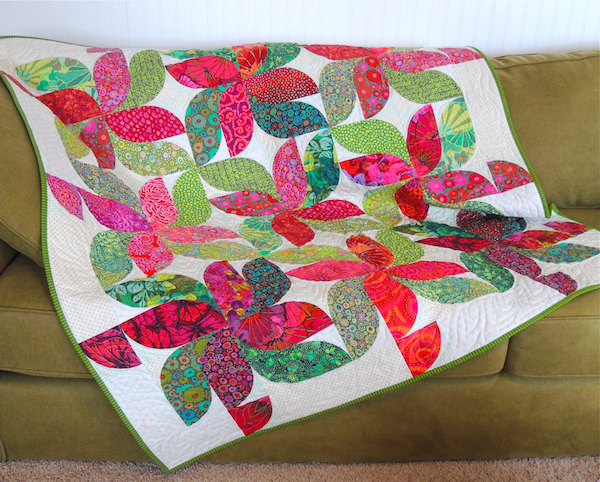 The green 'leaves' in the quilt recede behind the red 'petals' in the design and I wanted the binding to recede a little as well. 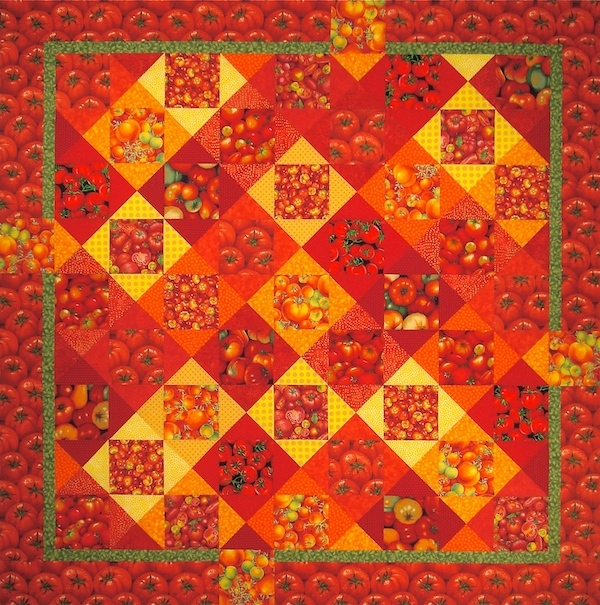 The red petals need to be the focus of this quilt. 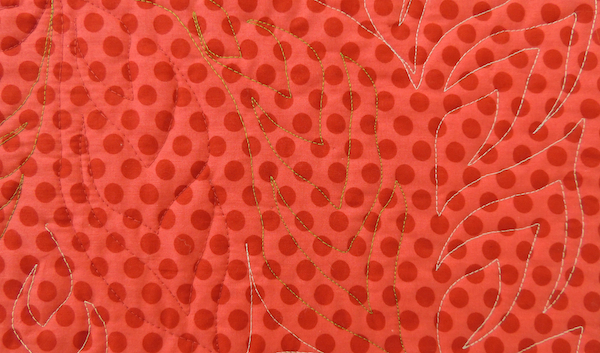 I felt any red in the binding simply brought too much attention to the edge of the quilt. I really do like Karen's tutorial though and will definitely be trying it on another project sometime soon. 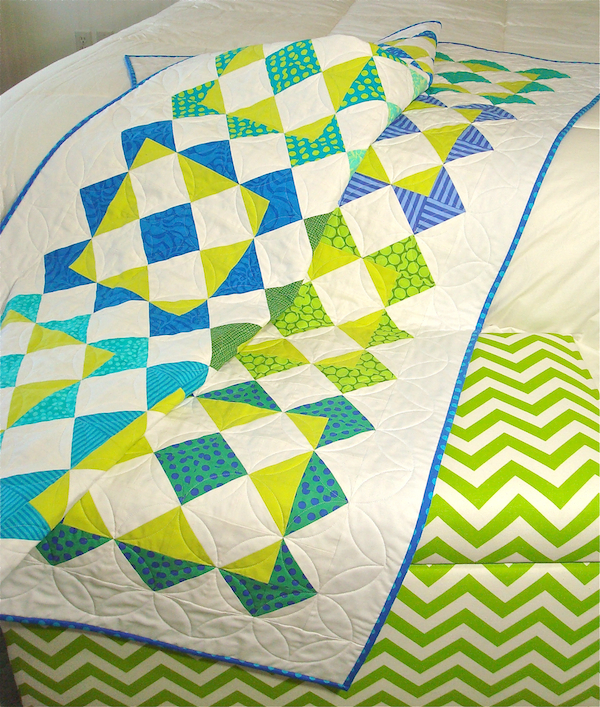 It's a great look for the right quilt. So green it is. A lovely green on green small stripe from the Caterwauling line by RJR Fabrics. It's been in my stash for awhile, the selvage says 2011 so who knows how long I've had it. I love it when I find the perfect fabric in your stash? Here's the finish . . .
At what point in the process do you choose the binding fabric? Do you have a go-to binding choice? Solids? Stripes? Prints? 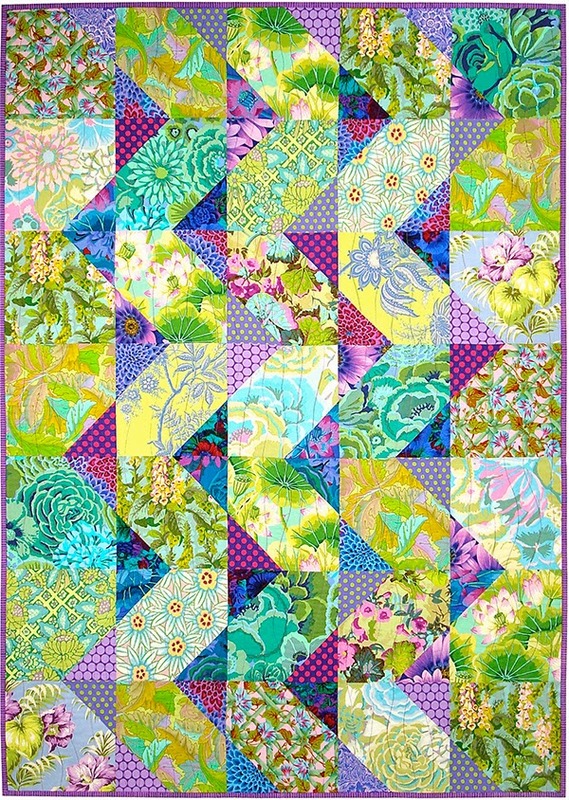 If you've made a quilt during this QAL along I'd love to see it. Shoot me an email with a photo. I hope to show more photos in a few days when I actually get the house decorated. Right now it's time to get my Christmas decorations put up. I think I hear Christmas carols calling . . . I'm closing out the month of November with a quick post on my bee blocks. 2015 marks three years for the Mid Century Modern Bee. I love the online connections and friendships I've made in this bee. In three years we've lost a few and gained a few members but I still feel connected to everyone through either their blogs and/or Instagram. In typical fashion, I waited till the end of the month to get November's block done for Michelle, (@speechyquilter on Instagram). 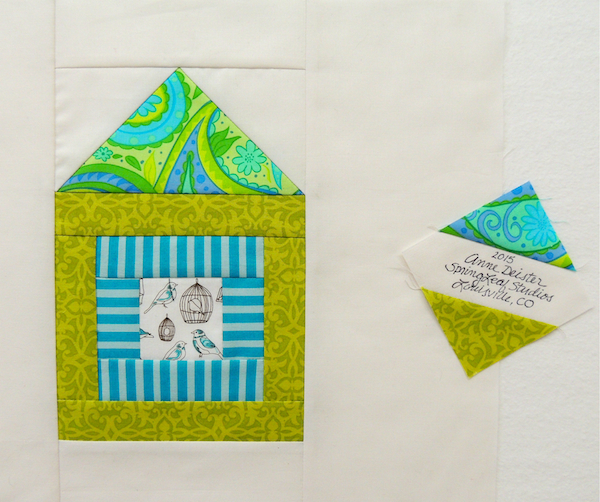 She asked for scrappy house blocks based on this great little tutorial. It was a quick block to make which is appreciated at this busy time of year. Everyone seemed to go with a little fussy cut image in the center so I did the same with this sweet little bird print. In a very not so typical fashion, I cranked out December's block before December even started. That's a first! It's for Elizabeth (@piecefullife on Instagram). She was really sweet to post her request early and also chose a super easy block. Solid colors and quick HSTs. I don't know what she'll be making but sewing these blocks has me considering something similar with a few prints I'm itching to use. So that's it for 2015 and bee blocks. I have received all the striped blocks from everyone and put them on my design wall. Now I'm contemplating several possibilites. 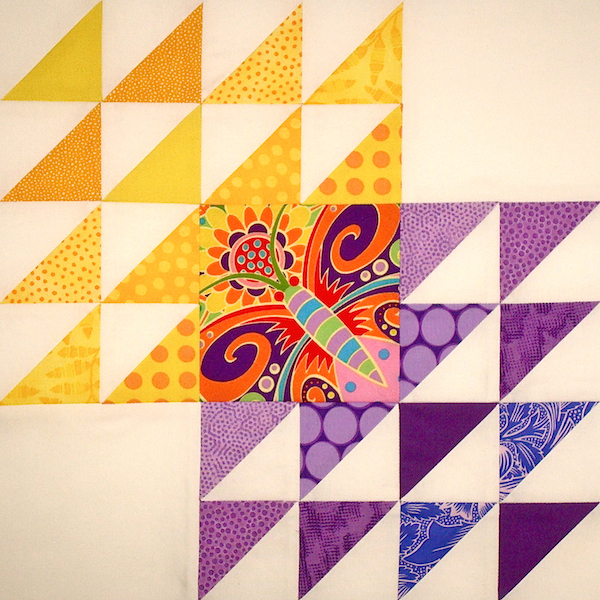 I'm even considering whether I could squeeze two quilts out of the blocks after I add in my part. Stay tuned as this idea develops. Don't all those stripes look amazing? I can't wait to get started. By taking a photo without any arranging, I can already see relationships between the blocks that I hadn't noticed just by looking at my design wall. It's hard to take it all in and really see those relationships between blocks and colors when viewing first hand sometimes. That's why I would encourage everyone to use your digital cameras. Then you can take photos of several arrangements and view them side by side on your computer to see where things work and where they don't. 2016 will bring some new members to our Mid Century Modern Bee which also means we're saying goodbye to a few. I'm sad to see Susan, Michelle, Carla and Mary go but life and priorities change for all of us. Thanks for all the great blocks you've made for me. I will miss you being a part of MCM. I'm going to venture off my regular individual color posts for a couple of months to explore some color theory concepts just a little. Nothing scientific or in depth. The study of color can be quite complex and there are already wonderful sources out there if you are interested in learning more. Instead, this will simply be another form of color observation. I hope you'll try it. 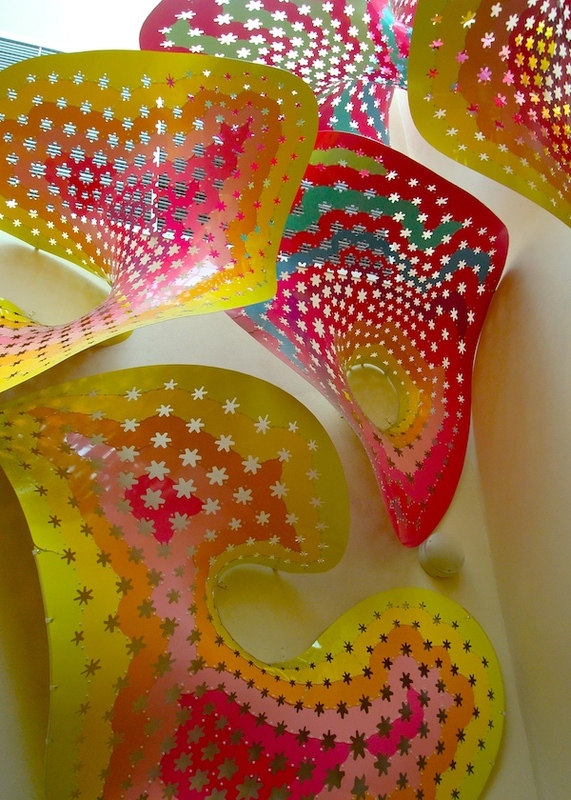 I promise it will get you thinking about color in new ways. I'm making the assumption you are familiar with the basic color wheel. This one shows the different groups of analogous colors. This month the color concept is analogous. So what are analogous colors? The most basic definition of analogous is three colors that fall next to each other on the color wheel. Look at the color wheel above and then any three colors in a row to see the variety of analogous color scheme possibilities. 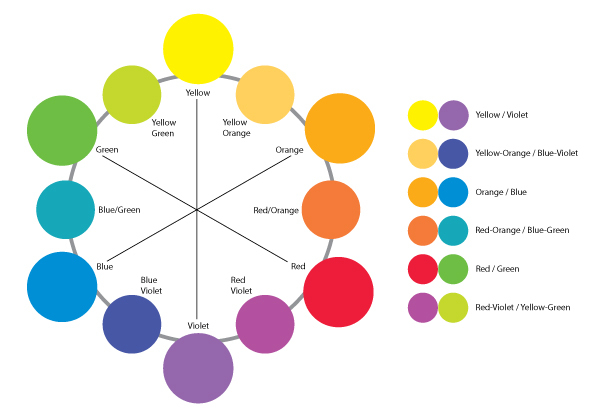 Because the middle color in a grouping shares color properties from both of the colors on either side of it, analogous colors are inherently harmonious. Analogous color groupings frequently fall into warm or cool ranges. 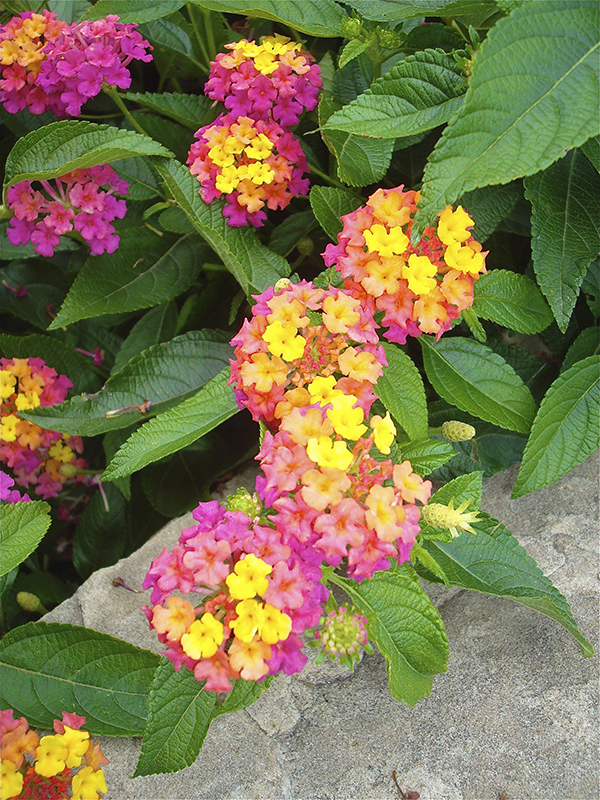 These warm or cool color groupings are often found in nature. Fall is a season for warm analogous colors. The changing colors of the leaves are a wonderful example of analogous colors in nature. Warm analogous colors are also found in summer flower beds like this test bed on the campus of Colorado State University. It's one of my favorite stops when I'm there in the summer. 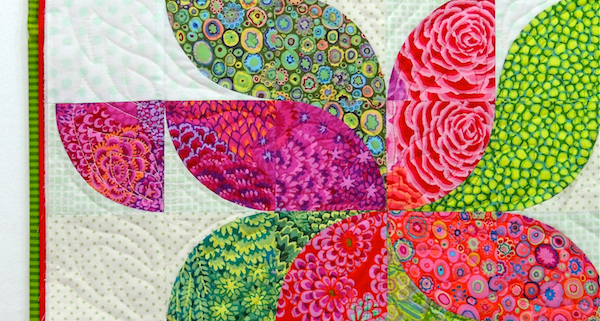 Because analogous colors are inherently harmonious, they translate well into great color combinations for quilting. 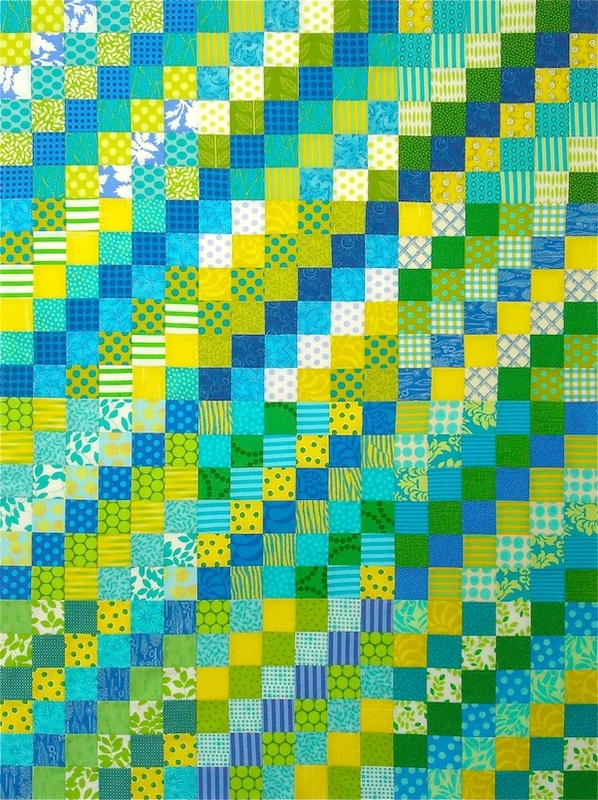 I find that one of my first color inclinations when designing a quilt is to select an analogous color scheme. See what I mean . . . The cool range of analogous colors is a particular favorite of mine. 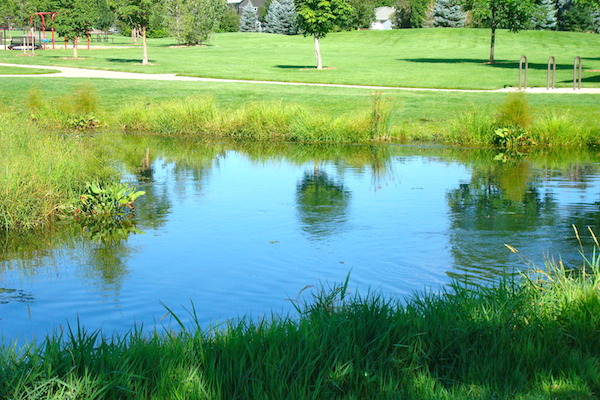 Think water, sky, green leaves and grass. Love those colors. Most of the examples I've shown use the three color analogous range, but if you expand the color range to four or even five colors you can add a lot of liveliness to the group. When you use five colors you are quite close to having a complementary color scheme depending on the color spread. I'll touch on complementary colors in December. So . 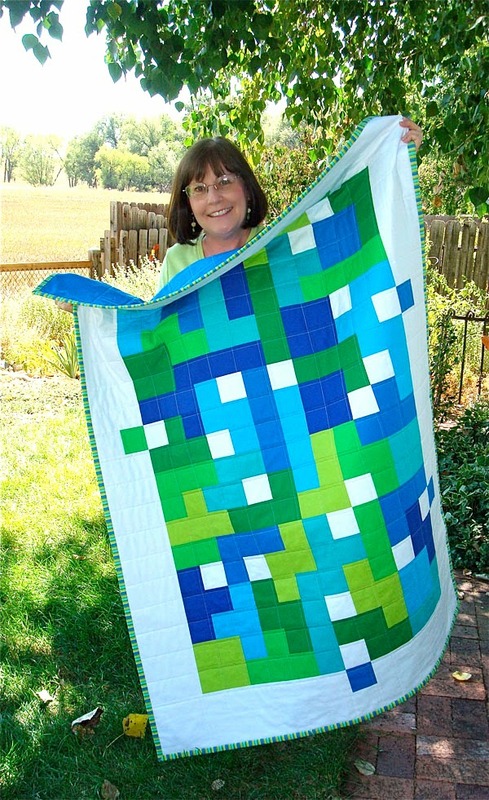 . . do you have a favorite analogous color scheme you like to use in your quilts? I challenge you to look around your home, your neighborhood, your work and really see the colors in your world. Look for some analogous colors in your life. Thanks for reading. As with my single color stories, my intention here is to look for these color combinations in my own personal world. To see the colors around me in my house, my environment and my experiences. For that reason I've chosen to use my own photos rather than rely on the abundance of beautiful photos and color schemes available through sites like Pinterest and Design Seeds. 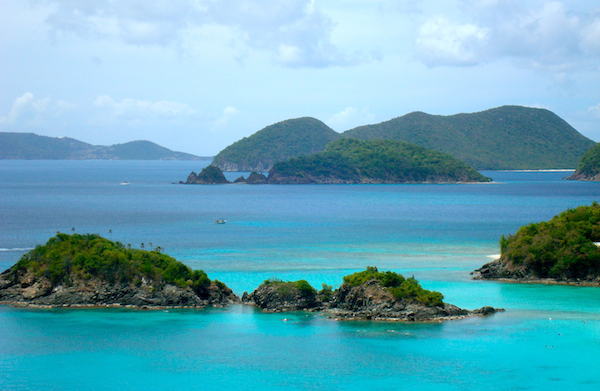 These sites are wonderful places for inspiration on color but I want my series to be personal . . . representative of the color I see around me. You can see all my other color stories under the Color Inspiration tab at the top of my blog. If you'd like to see additional beautiful color images, you can follow my Pinterest color boards here. I've also added a board on analogous colors here.